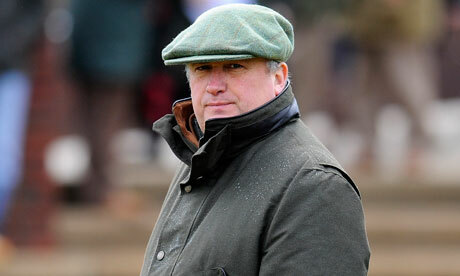 Paul Nicholls. Owning the Haydock chases since 2012. This National Hunt season just continues to build and build! Cue Card sauntering to his third Betfair Chase in commanding style. Coneygree making a satisfactory (?) return in the same race. Yanworth digging out a battling win over the dogged Lil Rockerfeller in the Coral Hurdle. Sire De Grugy showing he’s still got a fire burning by landing a valuable Ascot handicap pot. Nichols Canyon smashing the opposition in the Morgiana Hurdle. Identity Thief cruising to victory in the Cradockstown Chase. I mean wow! That’s just a weekend of National Hunt action of an epic scale! …and that horses names is POLITOLOGUE. On the novice chase front I would say this run from Paul Nicholls’ 5yo is right up there with some of the best we’ve witnessed this season. The grey jumped and travelled sweetly throughout and put the race to bed with consummate ease, winning by a comfortable 10 lengths come the line. They’ve been light with him to date with this being only his 7th career start and connections are likely to benefit from that this season. He’s a big, robust chasing sort and I would expect him to have a serious say in some of the top novice chases this term, before quite possibly going on to mix it with some of the best when stepping out of the novice ranks next season and beyond. Not only did the horse himself impress me but the win also went to boost a Paul Nicholls micro angle that is on my radar. That’s a serious set of figures, even for a man of Nicholls’ stature. It’s clear Nicholls isn’t heading to Haydock just for the weather (well who is to be fair?! ), especially with his chasers, and those sorts of returns demand our full respect and attention. When Nicholls sends a chaser to Haydock it makes sense to get your money down! Well we pretty much new that anyway but boy did he give Yanworth a fright in the Coral Hurdle on Saturday. He was off the bridle from some way out and his jockey Trevor Whelan was nudging and nurdling him for a long time…but he kept responding…and kept responding! So much so that jumping the last there looked a very real chance he was going to gun down red-hot fav Yanworth. Unfortunately Yanworth managed to find just enough to repel Neil King’s stable-star but boy does the Rocker (or Rocky as I believe he is affectionately known) come out of the race with a supreme amount of credit. Indeed, at the weights he came out the ‘morale’ winner of the race (if there is such a thing as a ‘morale’ winner). There is every chance that as a 5yo Lil Rockerfeller is still improving and that’s borne out by his RPR figures. His run on Saturday was a career best on that scale (162) a figure which follows on from his previous career best of 159, which was recorded last time out at Wetherby. Even more impressive was the fact that Saturday’s race was over 19.5f whilst the Wetherby race was over 24f. He’s tough, he’s adaptable (with regards to trip AND ground), connections are not afraid to pitch him in against the best, he’s got a cool name…what’s not to like about the Lil Rockerfeller!?! Admittedly he may just be a wee bit tricky to place with regards to ideal conditions and prime winning opportunities, I feel the National Spirit at Fontwell (which he won last year) could be the most suitable and winnable race for him, a race he could well make his own, but that’s not going to stop connections aiming him (quite rightly) at some of the top races and it won’t stop Rocky getting down and dirty and shaking up the ‘big boys’. If you want a horse you can set your clock to then Rocky is your boy! I know connections say he ‘didn’t feel the same as normal’ and ‘he had an off day’ and sure, I don’t see the horse every day and I don’t ride him (pretty confident he wouldn’t have been a 4/1 shot if I had been on top!) so they could well be right, but for me the signs are that he simply isn’t a Grade 1 animal. He’s had four starts at the top level now and each time he’s ‘disappointed’. For me that’s pretty knocking evidence he isn’t up to the top level. Now I’m not having a pop at him here, far from it, I’m a big fan of the horse, but in many ways I’m glad he didn’t, for example, manage to split Cue Card & Coneygree in the Betfair Chase. If that had happened I’m sure his OR of 154 would have been blown completely out of the water. And that would have been a shame and a complete waste of a very workable handicap mark. The main problem for him at the top level and in the races he would most likely be targeting is that there’s a good chance he’ll bump into a another front-runner, especially now Coneygree is back on the scene, and when he doesn’t front-run he basically doesn’t win. Admittedly there is a chance he will bump into a bigger field back into handicaps but it will also be ‘lesser’ opposition and he should be able to enforce his class at the head of the field and make others dance to his tune (as opposed to him dancing to another’s tune at G1 level, like what Coneygree made him do on Saturday). When he can dominate from the off he’s extremely difficult to pass, that’s a fact. Connections have said that they want to exploit his handicap mark off the back of this run and that’s great news, especially as he is just about to enter his ‘hot months’. His December to February form stands out – 1111121 (6/7) – and it’s a wise move to look for a valuable handicap spot in the coming weeks. If successful there then it would be worth stepping back up to Graded level although ideally keeping away from Grade 1 level. Something like the Pillar/Cotswold Chase at Cheltenham on Trials day in January would certainly be a worthwhile target. He won the Dipper at Cheltenham last season, so we know he handles the track, and a small field Pillar Chase that he can dominate from the front (with no Coneygree in opposition & ground to suit) would be a race I would like to see him in. He may not be a G1 horse but he’s certainly someway better than what he showed on Saturday.